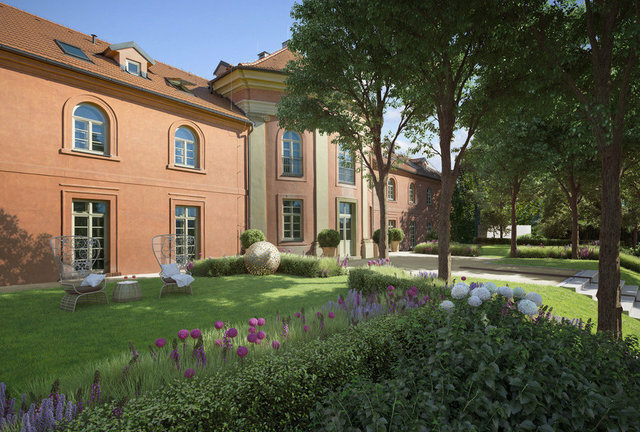 Le Chateau is an exceptional historical project in the heart of Prague. The building dates from the 17th century, during the famous Czech baroque period, and served as a grand country manor. This stately property can become an exceptional personal residence; however, its location, grounds, and layout also make it highly suitable as a corporate headquarters or a foreign embassy. Le Chateau is offered for sale in the shell and core stage, meaning that the new owner remains free to choose its final internal layout and materials. The entire building and grounds have just been extensively renovated and appointed in a modern-historical style. Le Chateau consists of two spacious, elongated wings and a central rotund section over three floors. It offers a total living space of approximately 1000 sqm with a staggering 1400 sqm private garden and underground garage for 7 vehicles. The concept proposal is revealed as pure baroque in form and reflects the famous French castles using enfilade doors and a majestic central staircase. For your comfort, the property is equipped with a lift leading from the underground parking for seven cars (with three other parking spaces on the street) to the first and second floor above. The entire ground floor opens on to the French-style garden, which provides intimacy and relaxation in the middle of mature greenery connected continuously to a park. The ground floor is laid out as the common area: The east wing has a grand dining room and extensive kitchen facilities, while the west wing offers a salon, bar and media room. A first floor annex holds full maintenance facilities, as well as a wine cellar and a security station. The second floor is primarily for the owners’ use: Aside from the living room and foyer, the east wing offers a master bedroom with two bathrooms and a dressing room, while the west wing has a meeting room and a large office. The third floor houses guest facilities, with four bedrooms, each with a private bathroom and walk-in closet, and a well-equipped fitness area in the central section, consisting of a gym, whirlpool and sauna, as well as a dedicated bathroom and dressing room. The windows of all major rooms in the house face the garden – i.e., south – and the public park and panorama of old Břevnov Quarter beyond.